Sizing a PV array correctly is not as simple as measuring the roof and filling it full of panels. With ever improving panel efficiencies, changing Feed in Tariffs (FiT), varying amounts of site demand and a saturated Distribution Network, many aspects need to be taken into consideration when designing the correct system. By engaging with Watt Energy Saver our clients get more than just a contractor’s approach of maximising the capacity of the roof. Our consultative design led principles help us understand the client’s requirements, be it maximising self-consumption, cutting CO2 or long term investment. No matter what the case, one common denominator is always required. Existing consumption. In a relatively immature marketplace, we often come across inaccurate self-consumption figures. These estimations are usually way in excess of what will actually be consumed on site, skewing the figures, usually in favour of the contractor and providing poor information for the customer to make decisions upon. It is also becoming increasingly common for the Distribution Network Operation (DNO) to require 6 figure sums to upgrade the network, if possible at all. With the site energy profile Watt Energy Saver are able to design an array to match the DNO’s capacity, and if site consumption allows, design an export limitation system to vary generation to meet the DNO’s limits. Again, the detailed level of design allows us to design a system such that the PV array would not export, leaving the export limitation as a safety device and allowing the customer to install a potentially bigger array with no DNO upgrade fees. Watt Energy take the same approach no matter the project size ensuring accurate design which delivers accurate figures for the customers review. We set out below the design process we undertake to ensure we offer our customers the best value whilst meeting design obligations. As we have eluded to previously, the prime information required is based around consumption data. To deliver accurate results we recommend the use of 12 months historic Half Hourly data. This data can be requested from your energy supplier in a .csv (Excel) format. We take the raw data and strip away unwanted information and summarise the annual consumption. In addition, we can pinpoint both maximum and minimum demand. This helps understand the site process and enables the customer to verify energy is being used at the correct period of the day, month or year. Once the Half Hourly data has been processed, it is imported into our design software. Here the site consumption profile is matched to the annual solar yield potential. Every 30 minutes throughout a 12 month period, the software checks whether the site consumption is more or less than the solar generated energy. The graph below shows a typical example of a recent cold store completed by Watt Energy Saver. 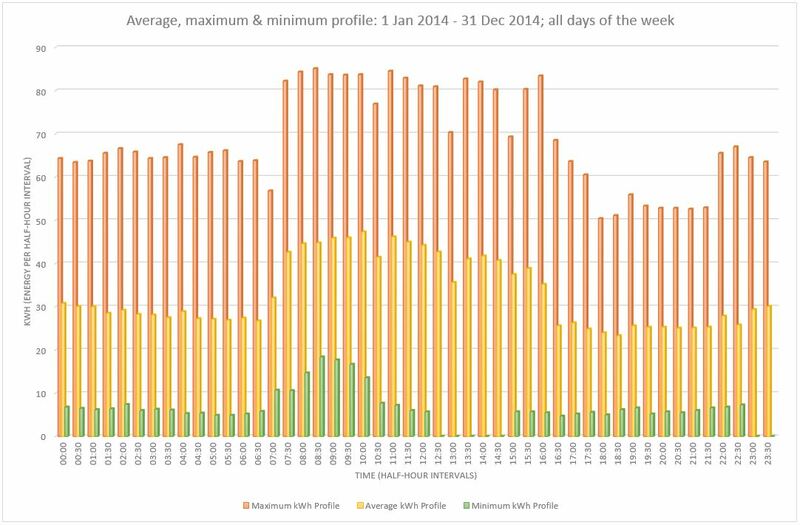 •	The Orange line shows site electrical consumption over a 12 month period. •	The blue line represents the amount of solar energy generated, again over a 12 month period. •	The Yellow line shows the revised grid supplied electricity after the solar PV has been installed. 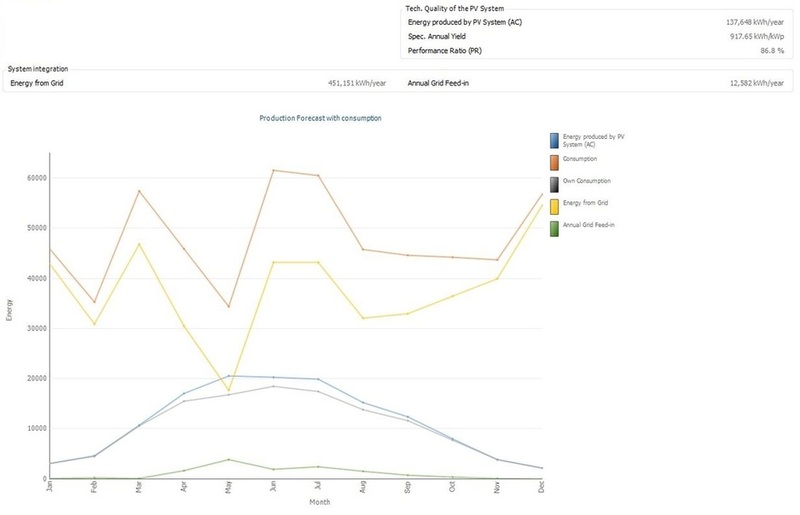 •	The Grey line represents the amount of solar energy which is generated on site is consumed on site. •	Finally, the Green line depicts the amount of electricity which is exported to the grid. 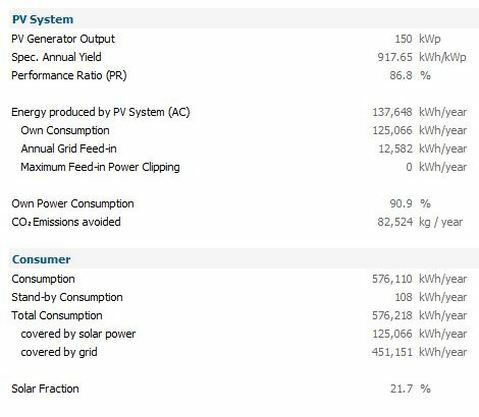 From these calculations, we were able to establish that a 150kWp would result in around 90.9% self-consumption. In this instance, self-consumption was important as a quick ROI was desirable. A 150kWp array was selected to maximise the FiT rate available. As an additional cold store was being built, the 9% which was shown as being exported in our calculations would be consumed when the new store came online.